This is a free crochet potholder pattern that will help you practice crochet afghan stitch. This stitch is also known as Tunisian simple stitch (Tss). It's one of the easiest crochet stitches in the niche of Tunisian crochet. Therefore, it's a great stitch to practice if you want to expand your repertoire of crochet skills beyond the basics. Learn how to crochet afghan stitch here. These are thick crochet potholders worked in worsted weight cotton yarn. Cotton yarn is always ideal for kitchen crochet. This pattern is great for beginners but is useful for crocheters of all skill levels. The potholders don’t require any increases, decreases, or complicated shaping. In fact, they are made up of basic squares easily joined together. The only extra detail is a simple added loop that allows you to easily hang the completed potholder in your kitchen. 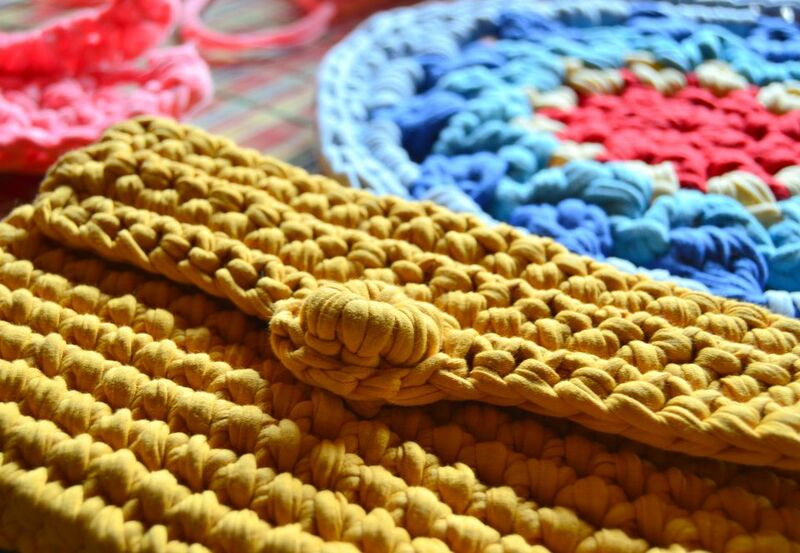 You'll just need a few basic supplies in order to make this afghan stitch crochet potholder. For each potholder, you’ll need approximately 3 oz. of worsted weight kitchen cotton yarn. For the Body of the Potholder: You’ll need a size J / 10 /6.0 mm afghan crochet hook measuring 10+ inches long, or your preferred size. Note that this is different from a regular crochet hook. Learn more about Tunisian crochet hooks here. For the Edging: An ordinary J hook is a good starting point, but you may need to adjust up or down a size if you notice a significant difference in tension. These afghan stitch crochet potholders each measure approximately 8 ¾ inches square before washing. This measurement includes the edging. The potholders can be expected to shrink slightly when you launder them, although not significantly. Work in afghan stitch until you’ve created a square. After about row 25, measure your work periodically to check the progress. Crochet two of these squares for each potholder you want to make. For example, if you’d like to make a matching pair of potholders, you’ll need four squares all together. For each potholder that you are making, detach the ball of yarn from one square (leaving a long tail of yarn to be woven in) but leave the yarn attached to the other square. Weave the loose ends into the wrong sides of all the squares. The edging is worked in the round, and it is created using single crochet and slip stitches. The edging is used to hold the two pieces of the potholder together. Ch 2 using the ball of yarn attached to a potholder square. Place the wrong sides of the squares together. The “face” of the fabric is the side that was facing you as you were crocheting each square. You want these sides facing outwards. Be sure that you hold both the top edges together, as there is one stitch less on the top than the bottom. Working through the front and back loops of both squares, work one single crochet stitch in each stitch, all the way around. When you get to the corners: (sc, ch 2, sc in the same stitch) and then continue working sc. At the end of the round, ch 12 to make the hanging loop for the potholder. Join the hanging loop to the body of the potholder with a slip stitch. Work 1 slip stitch in each sc all the way around. When you get to the corners, work a slip stitch into the ch-2 corner space. When you’ve worked slip stitches all the way around the potholder, end off, leaving a tail of yarn at least 6 inches long. Instead of using a single color, change colors to make stripes. Work with two strands of yarn together. For example, try Red Heart Scrubby Smooth combined with regular Red Heart Scrubby, which is a more textured yarn.